Cool dangerous things from the past that Nader Didn't like. New old stock Shimano click stick 3. Banned about 1975 for it’s gonad crushing engineering. had to re-build it because I dropped it and lost some internal widgets. Had to replace the internal ball bearing with a BB of similar size to make the gears click. The shift pattern is reversed, so the stick drops back to get a higher gear(much cooler). The other coolest thing ever is that the ‘3' on the hub does nit move with the stick, it stays upright and stationary. Not too ridiculous to ride with the silly bars, same height as Malibu, but much taller than Corvair. I’ve heard Nader was involved in this too. 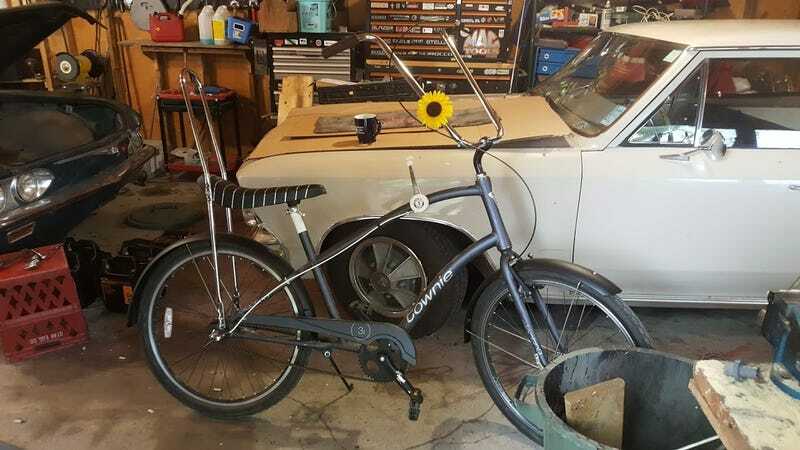 Chopped bike and corvair bonus photo.